All of the courses were excellent – you can marvel and drool at the pictures above. Picking a favorite would be ridiculous. There were pieces of each dish that blew me away. sometimes it was just a small piece that had your head turning (the crispy duck skin or the multi-textured vegetables) and sometimes its was the dish as a whole (the soup with the sous vide egg) – really it was incredible and I can’t give these to wonderful chefs enough praise. Yaakov Oryah, Eye of the Storm, 2016 – A gift from Yaacov, I actually had this during the pre-game while hanging out – where all of a sudden a few people started showing up as they heard from their neighbors there was going to be a party. One of drop-ins the was Elon Gold the comedian who was on his way to the airport to get back to LA. The chef’s created a few mini-versions of the courses above and I gave him some some of this wine which he seemed to like. So did I. No real change since previous tastings. I am on record as being a big fan – both of the 2016 and of Elon Gold – this bit is seasonal and one of my favorites and there is even a wine reference in it  …. Pierre Miodownick, Sauvignon Blanc, 2017 – This was made to order for client and PIerre sent a sample for us to taste just as a bonus . This wine was made in a decidedly old-world style that I usually really enjoy (I am really not a fan of aggressive new world SB as I have noted here MANY times) – with typical floral aromas. The mouth though was a bit too round for my taste and while I appreciate that this was not an aggressive SB, it perhaps could have used a touch more zing to really be successful. Yaakov Oryah, Hunter’s Valley, Semillon, 2009 – A gift from the winemaker. No real change from my previous notes – this wine has not changed much in the last year or so and is at peak IMHO. How long it will hold is anyone’s guess as a 9 year old Israeli white is pretty much unheard of. What is interesting is that many of the French attendees thought that this wine was starting to slide past peak and lacking in acidity. This was a theme that would repeat itself throughout the night on various bottles. The French seem to like there wines far younger than we Americans. Carmel, Kayoumi Vineyards, Riesling, 2014 – This is the finest Riesling Carmel has produced. It has matured a bit since release and has lost a touch of the acidity it once had – but it still absolutely rocks. Warning for the casual drinker, the nose here is full of petrol – DO NOT LET THAT TURN YOU OFF. Give it a chance. I happen to love that smell but if you are not expecting it, you could get turned off. What it has lost in acidity it has gained in heft and mouth feel picking up characteristics more associated with it’s German cousins. I recently tasted a 2016 blind (I’ll be posting about that eventually) – and it is nice to see how these wines are progressing. I really hope that the change in winemakers does not mess with the continued success of this wine. Yaakov Oryah, Alpha Omega, 2016 – Another gift from the winemaker – I have written about this wine before – it simply is breathtaking. See my previous notes – there has been a little movement in that it has slightly mellowed over the last few months and the tannin is slightly more integrated. This is one of those wines that you really want to follow the development of over a couple of years. Tzora, Judean Hills, White, 2017 – Generously gifted by the winemaker – this wine is off the charts this year as I have noted previously. People should be seriously stocking up. It is one of my absolute favorites for the 2017 vintage. Tzora, Shoresh, White 2017 – As above, also gifted by Eran. Again, no real change from the notes I referenced above. I think the increase in Chardonnay this year (25%!!) here sort of flattened out the wine a little. Roger Moreux, Sancerre, Chavignol, 2012 – This is the absolute best SB I have ever tasted. I don’t remember if I have ever written about it formally – but simply put – it’s an experience. The wine has changed a little since the last time I had it about a year ago. The nose while still absolutely kicking and super floral – is probably touch more muted than it was previously. Still incredibly beautiful and even 6 years old is the best smelling SB out there. In the mouth, it has matured into something even better than it was previously, gaining a touch of roundness that wasn’t there before that ultimately just adds to an incredible mouth feel that unfolds with flavor as you let it roll off your tongue – lemons and apples and a it of bitterness that keeps it refreshing. Really excellent! My favorite white of the night for sure. Condrieu, 2017 – This was the first of Nathan’s wines. Codrieu is a French appellation in the northern Rhône producing exclusively Viognier wines. I have no idea what the producer name is going to be on this bottle and from what I understand it was a very limited production and almost all of it was pre-sold – so this was a true treat. The wine has an intoxicating nose – very floral with fresh stone fruit. In the mouth what first hits you is the wood – and I was not expecting it based on the nose. This wine has spent considerable time in oak – and you can taste it. For me the oak sort of was a barrier to fight through to get to the fruit. This wine was just bottled and I think the oak really needs time to integrate. If the nose is any indication, it’s going to be great. Don’t expect it to be cheap though…. from what I understand these wines go for over €60. Here was another time where the French palate seemed to prefer the youth of this wine – where I thought the oak was currently overpowering g and slightly out of balance – the French around the table seemed to think it perfect as is. This will be a continuing theme. Covenant Israel, Blue C, Viognier, 2017 – A perfect counterbalance to the of the previous wine. This wine is unoaked – and while the nose doesn’t at all come close to the Condrieu, for me, right now this was a more fun wine to drink. Of course with the oak the Condrieu will likely be able to age a bit while this won’t, but I preferred the unadulterated freshness presented here – and of course the fruit shines through. Another top white of 2017. Shirah, John Sebastiano Vineyards, Pinot Noir, 2014 – this wine has softened considerably and is sliding just past peak. All of the varietal e flavors are there – cherry, strawberry, some warm spice and a bit of earth. But the acid and tan I have dissipated and the wine presents more fruity than I remember. And again many of the French couldn’t stand it, saying it was sweet. I didn’t taste that at all. Fruity and new world sure. And I guess because of the lack of acid and tannin – there was less to balance that out – but sweet? No. In any event – drink up. You aren’t doing yourselves any favors by holding this one. Château Rollan de By, Medoc, 2012 – this wine has finally started to come into its own and is now showing very nicely. Still has a ways to go, but there is a nice progression here. Much more typical earth and mushroom, fruit still there but moving to the center. Still showing young with nice acidity thought the tannin has also started to integrate. Another year or two and we should be at peak. Château Haut-Condissas, Prestige, Médoc, 2012 – As noted above, this was decanted for a bit and that made for a very enjoyable experience here. In the long run, the ’11 is a better wine, but if you HAVE to open one, you’re gonna have a good time. Don’t get me wrong – this guy needs more time too, but it’s approachable now. Tannin here was much more integrated and the acid more in balance. Fruit is a little more up front than other vintages – but the profile is mostly in line with what you would expect. Really great stuff. Teperberg, Syrah, Barrel Samples, 2017 – Provided graciously by winemaker Olivier Fratty, we tasted 2 separate Syrahs destined for Teperberg’s Legacy range. Really, that’s slightly misleading. It was the same fruit but one bottle had been aged in Bordelaise barrels while the other in Burgundy barrels. Both of these wines will be blended into the final wine – and are really not meant to be tasted separately and therefore I won’t bother describing them here other than saying it was very interesting indeed seeing the effects of different wood on the exact same wine. This is something that most of us usually don’t get to experience. We next tasted 3 wines that Nathan is involved win from the Vienne region of the northern Rhone. These are all still in the barrel so no full notes here – but it was interesting to taste through 3 separate sub-appellations Saint-Joseph, Côte-Rôtie & Crozes-Hermitage – and I can say that the Crozes-Hermitage is going to be KILLER (with the Côte-Rôtie showing potential as well). Château Giscours, Margaux, 2015 – Thankfully this wine was decanted for a number of hours and served near the end of the evening. It is simply great – and will be AWESOME. Tons of berry – both on the nose and in the mouth – primarily blue , but black and red too. Excellent herb and earth and nice warm spice. Really my words aren’t going to do this any justice. This was the finest wine we were served for sure. Kudos to whoever brought it. Capçanes, Peraj Ha’Abib, Montsant, 2014 – The 2014 vintage in Spain was great because it made for really high quality wines that were approachable on release. It probably means that they have less time in the tank – but I was drinking this wine now – so who cares. And I loved it too. Not anywhere near as complex as it’s older brother and slightly fruitier with a hint of leather. Really liked it a lot. Yaakov Oryah, The Old Musketeer, 2008- The final gift from Yaacov who was RIDICULOUSLY generous. I have written about this wine many times. It is the very best Israeli dessert wine ever made. It is one of the best kosher dessert wines ever made period. It is an absolute treat to drink this each and every time and this time was no different. Netofa, LBV, 2010 – I am generally a fan of the Netofa LBV, but this bottle did not show well – and it was a gift from Pierre so storage was not the issue. Still – it was so out of whack with previous tastings that I have to assume it was some sort of defect. It’s just very hard to tell with a dessert wine…. All in all this evening was super special. 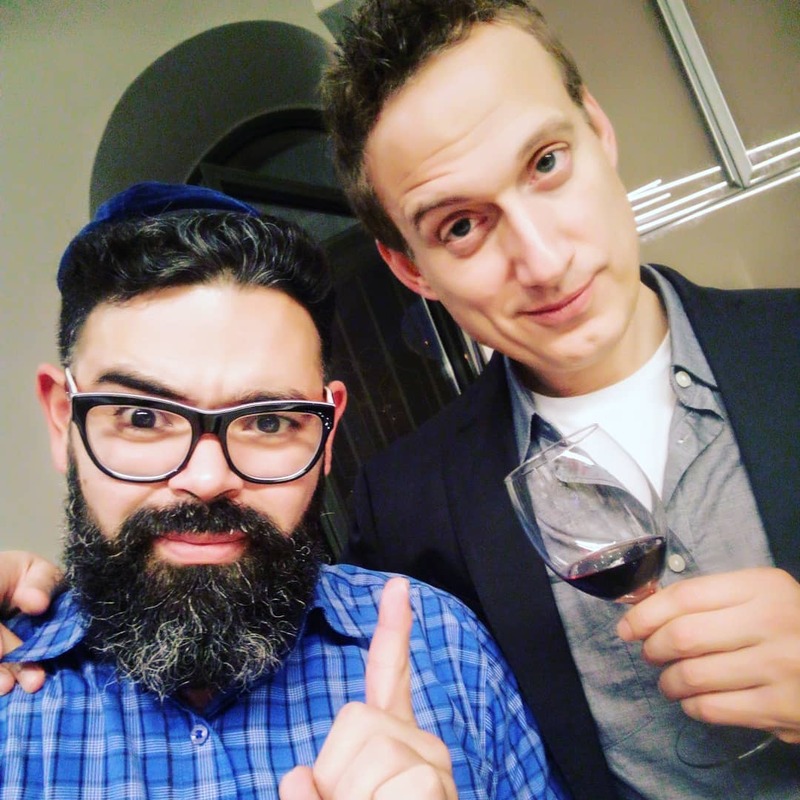 My thanks to Nathan for organizing, Chefs Avner Guzman and Bracha Arnold for cooking, and the various winemakers and attendees for some excellent wines!